WCU’s football team has been off to an amazing start. It has been a collective effort as the team currently holds a 4-0 record and will look to keep this momentum up moving forward. The Golden Rams powerful offense has put up an amazing 44 points per game. 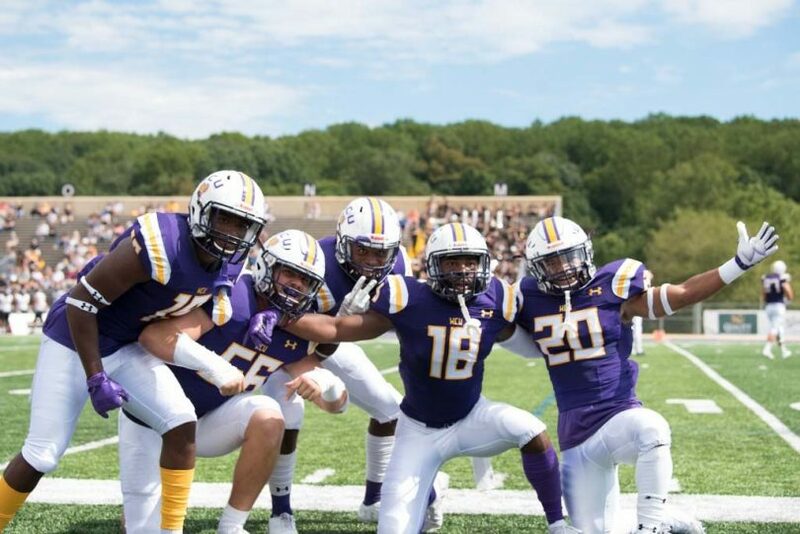 The defense also has been doing a wonderful job as they’re limiting their opponents to an average of only 11 points per game, leaving WCU’s average win differential at an impressive 33 points. Even the special teams unit has been doing a great job as two members of the team were awarded Pennsylvania State Athletic Conference (PSAC) East Special Teams Athlete of the Week honors. Sophomore Andrew Chegia won the honor for Week 1 and teammate Brendan Paulison, a senior, won it the following week. WCU’s collective effort on the field hasn’t gone unnoticed, as they’ve been climbing up the American Football Coaches Association (AFCA) polls. After not being ranked at all during the preseason, WCU has been in the national rankings for the third consecutive week. They debuted ranked No. 22 two weeks ago, moved up to 18th last week and now find themselves creeping into the top 10 as they sit at No. 13. WCU will look to keep their undefeated record as they play their next three games on the before returning back to Farrell Stadium for their homecoming game against Lock Haven University. Last season’s soccer team saw a lot of accomplishments come their way. Head Coach Michael Benn was selected PSAC Coach of the Year, the team claimed their first PSAC regular season title and their first NCAA Tournament victory against East Stroudsburg as they would advance as far as the third round in the tournament. Overall, it was a pretty impressive season for the Golden Rams. As the reigning PSAC regular season champs, the Golden Rams were a favorite to come back and win it all again. The PSAC released its men’s soccer preseason coaches’ poll and the Rams received four first place votes ahead of schools like Gannon, East Stroudsburg and Mercyhurst. Even after being picked favorite to repeat—it will be hard for the Golden Rams to match their overall record of 14-3-2 from last season. It’s been pretty much a rollercoaster start to the season as they’ve already almost matched their total amount of losses and ties as of last year with a 4-2-2 record through eight games so far this year. The Golden Rams remain nationally ranked at No. 16 on the United States’ Soccer NCAA Division II Poll. The team will travel to Millersville for their next game before returning to Rockwell Field for a game against California University of Pennsylvania. On the other hand, WCU’s women’s soccer team is coming off a very impressive season as well. Similar to the men’s team, the Lady Rams saw their season come to an end after a tough fight in the NCAA Tournament. After claiming their seventh Atlantic Region title in program history, the Lady Rams advanced to the elite eight for the first time since 2014 where they were defeated by Mercy University. With three All-PSAC selections from last season returning, WCU came into the season with an experienced core ready to pick up where they left off from last season. They have been off to a fast start, tallying only one loss and one tie to go along with five victories over schools like Seton Hill, Wilmington University (Del.) and Mercyhurst and more. WCU recently suffered their first loss of the season at the hands of Bloomsburg University, which unfortunately, dropped them out of the top 10 rankings. The United States Coaches Association released their Division II women’s soccer poll and it had WCU ranked 12th. After debuting the season ranked No. 8, the Lady Rams won five straight games and found themselves ranked as high as No. 5 before eventually falling to No. 12 in the past week. Standing at 5-1-1, the Lady Rams will look to keep their momentum going with matchups against Millersville, California University of Pennsylvania and Gannon University ahead of them. Check WCU’s women’s soccer team out against California University when they return to Rockwell field on Saturday, October 6. WCU’s field hockey team is coming off an historic season, which saw them capture the PSAC Field Hockey Tournament title. Seniors Kaitlin Hatch and Taylor Bracale will look to lead this year’s team back to the promise land. Hatch and Bracale are coming off stellar seasons, as they both were honored first team All-PSAC and first team All-ECAC. Hoping to have the same amount of success as last season, the Lady Rams came into this season ranked No. 5 on the National Field Hockey Coaches Association (NFHCA) preseason poll and after week one, they were ranked No. 7. WCU bounced back quickly after starting their season off with a loss against Stonehill College with four consecutive wins. Their record currently stands at 4-1 and this win streak has landed them at No. 3 in the latest NFHCA poll. The Lady Rams will look to add to their winning streak on the road against a tough East Stroudsburg team before they return back to Vonnie Gross Field for a match up against Millersville University. Last season WCU’s talented roster was fortunate enough to reach the NCAA Tournament last season but eventually lost in the first round to Indiana University of Pennsylvania. It’s pretty obvious that loss fueled the team coming into the new season. This season’s Lady Rams probably had the best start to their season of all WCU’s athletic teams. Almost a month into the season, the Lady Rams suffered their first loss against Gannon University. The Lady Rams pulled off an unbelievable 14 straight wins to start the season. The team will be going into the second half of the season with a three game stretch here at Hollinger Field House. Be sure to check them out Tuesday, October 2 against Millersville University. Tyler Jefferson is a third-year student majoring in communications and minring in journalism.  TJ876163@wcupa.edu.